For a moment I thought about ending this post with no text and only the above picture. After all, one could write page after page about Senator Graham and only begin to scratch the surface on how he has betrayed the citizens of South Carolina, the nation, the Constitution, and the conservative movement. When I head the news that four Republican Senators were now supporting the confirmation of Elena Kagan for the Supreme Court, I instantly knew that Snowe and Collins (both from Maine) would be among them. The other two proved to be a bit trickier. Lugar (Indiana), I might of guessed but didn’t. 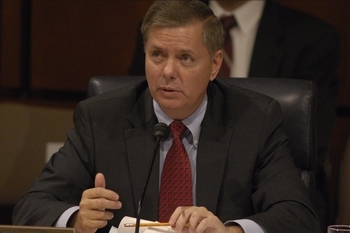 Then we have Senator Lindsey Graham (South Carolina). This guy keeps making news for all of the wrong reasons. Certainly there have been some surprises with Supreme Court nominees in the past, nevertheless, Graham’s sad eagerness to readily endorse Obama’s picks of Sotomayor and now Kagan is deeply troubling. Having twice been censured by the SCGOP thus far, one wonders how he has been able to win the Republican nomination. One thing is for sure. If he is a conservative, as he claims, then I assure you the movement is doomed. Please, please, please South Carolina voters. I’ve met many of you during my work in your state. You have elected one of the best and also one of the worst Senators in the country. Can’t you find someone who better represents your values than Grahamnesty? For more information try reading a recent post by the Conservative Examiner. He didn’t have credible primary opposition this last time or he would’ve been toast. Please, someone, anyone who’s a constitutional conservative in SC, step up in 2014 and get rid of this guy.